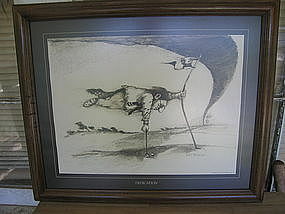 Professionally framed print of "Dedication" from the Thought Factory and dated 1975. The frame is 22 x 18 and the viewed print is 16 1/2 x 12 3/4 inches. The frame has several scratches and the print does not lie completely smooth. This is not something that is noticed without tilting the frame, but the price is reduced due to these factors. I have additional photographs by email. I have several matching prints in the series available for purchase and each is priced according to the individual condition. I need your zip code to calculate the postage.